Check out Gary's list of resources for sale. You can sort by category also. This tool helps men sacrificially meet the needs of their wife's heart and explain their sexual needs to her. Unlike many behavior modification approaches to battling lust, this study focuses on heart transformation. This tool helps Christian men stay focused on Christ's mission for them in each area of their lives. 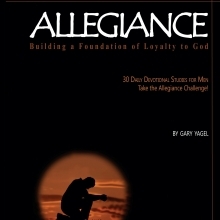 These 2-page devotionals help men deepen their love for Christ and express that love as allegiance to Him.